Want to watch your LCD, Plasma or Smart TV in style? Our professional engineers are specialists in wallmounting TVs. 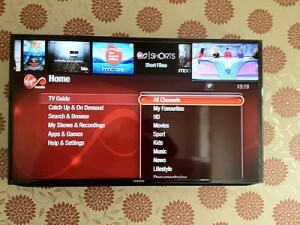 We install ALL types of TV ( 3D, HD, LED, LCD) onto all types of wall. We supply and install audio visual cables and mounting brackets for all makes of televisions as part of the package price. And, of course, you can rely on our expert advice for each and every installation. We also wall mount curved TV’s. We are in Halifax; on the doorstep of Huddersfield Wakefield Leeds and Bradford so call now for your free TV wallmounting quote. Installation of 46″ Samsung Smart TV all leads hidden outside the building and run down the outer wall and back in behind skirting board for a nice effect – job inc bracket, 2 x 10metre high speed HDMI cables, power cable lengthened and of course my time cost £155 inc VAT.